Ex Vivo Case Study | Yecuris FRG: humanized animals and human hepatocytes platform for your next great discovery. Primary human hepatocytes, freshly isolated from Yecuris FRGN mice, were transduced with recombinant lentiviruses. A GFP marker revealed transduction efficiencies of >80%. In addition, human hepatocytes were first transduced ex vivo with an NIS (the sodium-iodide symporter) expressing LV and then the transduced hepatocytes were transplanted into FRG KO mice. Transplanted animals were highly repopulated with lentivirus marked human hepatocytes. Animals that received the transduced hepatocytes reached levels of repopulation ≥ 80%, a repopulation rate equivalent to the controls transplanted with unmanipulated hepatocytes. 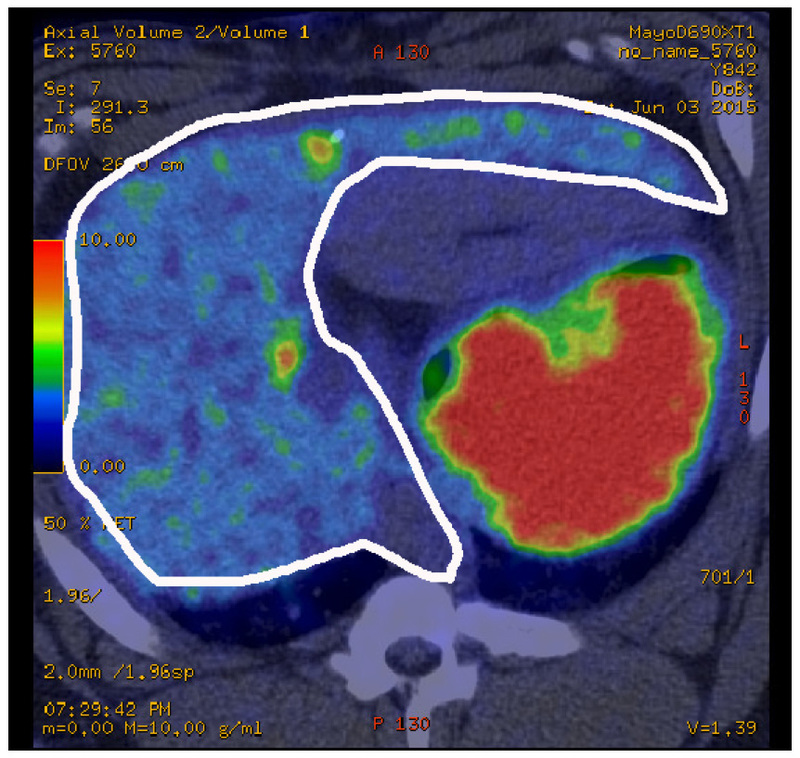 The image to the right is a PET/CT scan of a highly humanized FRG KO/LV:Pig NIS mouse after treatment with [18F]TFB. The relative intensity of [18F] TFB uptake is represented by low (blue) to high (red). The liver is marked with a white boarder.